A music video has gone viral on you-tube, with millions of hits. Currently the third most popular worldwide, it is no American or European hi-tech state-of-the-art special effects video of semi-naked women prancing to hip hop rap, nor of a teen idol or girl group crooning about adolescent limerence. ‘Voy this kolaveri di’ (‘why this murderous rage, girl’) is filmed in a recording studio in Tamil Nadu, simply but with slick sophistication. It is a humorous skit sung by Dhanush, the son-law of South Indian megastar Rajnikanth. What makes it different is that it uses ‘Tamglish’, a modern argot of English and Tamil, with mixed terms like ‘kaila glass’ (glass in hand), ‘super-maama’ and ‘moon-u'- rather like Desmond de Silva's English-Sinhala-Tamil bailas. Which means, roughly ‘Hey boys I am singing this song, a song of rejection in love, a song of failure...’ Rather like a Milton Mallawarachchi ‘boot song’, only with scotch whiskey in a dive instead of Necto in a seaside restaurant. Forty years ago, before the internet and long before social media and you-tube, Sri Lankan singer A E Manoharan's Sinhala/Tamil song ‘Surangani’ made a similar conquest of India (and also Indonesia and Malaysia). Many Hindi speakers sang it without knowing the meaning of the words. Numerous people thought it was a Goan song - a Konkani version was made later. It even featured in Bollywood and Kollywood films, in both Sinhala and Tamil incarnations and its music was used in a short video against American militarism. When Manoharan (known in India as ‘Surangani Manohar’) sang his hit, Sri Lanka was at a peak in its cultural renaissance. The century which began about 1880 saw a reawakening of the hitherto subaltern, repressed vernacular art, literature and music of the conquered island. In particular, the first three decades after formal independence saw new artistic forms flourishing. For example, the traditional blend of song and dance of the rituals of the popular religions was transformed into a modern dramatic and ballet form by Sarathchandra, Chitrasena and others. Foreign drama was effectively translated into the vernacular medium, plays such as ‘Hunuwataye Kathawa’ (‘The Caucasian Chalk Circle’) and ‘Hotabari Yuddhe’ (‘Animal Farm’). These imports again fertilised the indigenous theatrical imagination. There were similar developments in cinema, in literature, in painting and sculpture and even in architecture. Even clothes designers experimented with new forms - the Sari took on new shapes and the cloth and jacket of the poor became fashionable for the wealthy. The most eloquent expression of the new culture was through music. 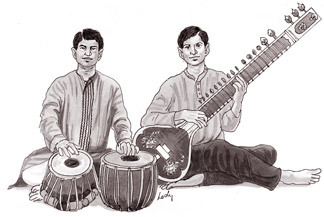 The music of the nadagams, baila music, folk songs, kavadi and the imported Bengali tradition of Shanti Niketan combined to create one of the most vibrant musical cultures in Asia. We had multiple layers of music, from the highbrow - what I have heard called the ‘visharada love’ - of Amaradeva, through the middlebrow (the ‘boot love’ of Milton) to the lowbrow (the street love of Jothipala), with innumerable other strata in between. Unfortunately, the gravitational effect of the huge Tamil population in South India meant that there was much less independent insular development in Tamil culture. This is despite the fact that Tamil speakers in Sri Lanka have a culture quite distinct from those across the Palk Strait; even the language is marginally different - some would say more refined. Interest centred around strictly sub-continental forms such as Bharata Natyam and Carnatic music. What this meant was that Tamil-speaking popular singers such as Manoharan and Mohideen Baig had to vocalise in Sinhala to gain an audience. Sri Lanka ruled the airwaves of South Asia through Radio Ceylon, the oldest wireless broadcaster in Asia, which dominated the English, Hindi and Tamil broadcasting milieux in the region. It was the Sri Lanka Broadcasting Corporation which was the major player in popularising sub-continental music. Uniquely Indian-English songs, such as ‘Bombay meri hai’ and ‘I married a female wrestler’ owed their popularity to the SLBC, but also many Hindi and Tamil hits. Undoubtedly, ‘Surangani’ must have owed much of its fame to the State Radio. However, starting about three decades ago, the culture of Sri Lanka began a slow but rapidly mounting decline. It has become hopelessly derivative and vulgar; where it used to be thuppahi in the sense of being vibrant and absorptive, it is now thuppahi in the sense of being an inferior copy of others elsewhere. This is most true of our music. As a friend of mine noted recently, synthesizers are being used increasingly, even when they are not required - and where they actually obtrude - and dancing is mechanical, with watered down matching movements having little integrity. Pseudo-Bollywood dancing, but without the thorough practice. At the same time, SLBC has fallen from being queen of the airwaves to subsisting as a mere wayside courtesan. Gone are the glory days when it decided who became a hit singer. It failed to reposition itself adequately to compete with the television, CD and internet revolutions which changed the way the subcontinent listens to music. So my chagrin at ‘Kolaveri di’ is manifold. Our music videos have none of its polish and perfection, looking sickly and amateur in comparison. It represents how far Sri Lankan culture has fallen behind in the 21st century, how we have not really adapted to the new technology, and how we lost our way. Hudson Samarasinghe is making a valiant effort to revivify the SLBC; together with the Chinese-built the new opera house on the old Colombo municipal cricket ground, this may help begin a new flowering of our performing arts. Whether we can also transform them via the new media, especially among the sophisticated and wealthy audience of the expatriate Diaspora, remains to be seen. For this to happen is vital for the future of Sri Lankan culture.